Inside are candles that smell like baked good, including to DIE for little Chocolates! Come see these items and more At the Mile of Hope Breast Cancer Craft Fair at the Knights of Columbus , Wappingers Falls NY Thursday 10/27 3- 9 pm ...email me for more information! Ok so the cat is out of the Bag this Special Card was the one I sent Shelli Co Founder of Stampin Up for her 50 th Birthday!! Stampin Therapy Night Oct 21st! 4 QUICK AND EASY cards but you WILL NOT BE DISAPPOINTED! These cards are designed to help you get ideas when you need a card in a hurry and don’t have a lot of time to make one. 4 cards and envelopes $15 or free with a $25 catalog order! FOR A LIMITED TIME : EVERY NEW FRIEND YOU BRING TO ONE OF MY CAMPS/CLASSES YOU WILL GET A FREE MARKER! . Bring one or more! The more the merrier! I reserve the right to change date so please keep checking for updates! My ANNUAL HOLIDAY STAMP A STACK! Gently Falling Leaves Stamp Set( 2 step stamping ) with quilled Acorns. These items are from the NEW Holiday Mini and some from the Big Idea catalog , call or email me today with your order! You can also order on line through me! 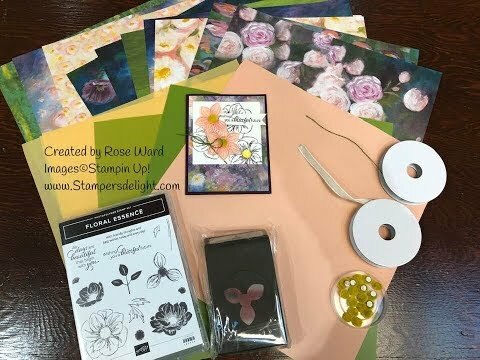 Get a Stampin Up BIG SHOT FREE! About the big Join Stampin'Up!/ my team I received many question and her most of the question and answer but PLEASE feel free to contact me if you have other question. I would love to have YOU join my team. 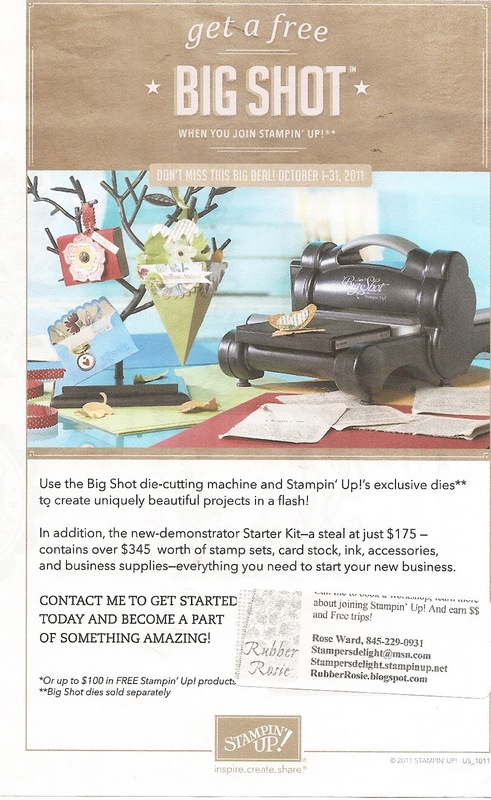 Right now till the end of October you will get a FREE big shot or $100.00 of your choice of Stampin Up! product if you join this month. This is a super great dea. A: You only have to submit $300 in sales per quarter. Hold at least one workshop a month, and you’ll not only cover your sales minimum, you’ll also be able to pay for some of your own hobby as well. Also, you can submit your sales in any increment you wish & still get your discount and commission. A: Absolutely not!! Stampin' Up! supports the hobby demonstrator just as well as the career demonstrator. You can put in your own order or collect orders from family & friends to equal the $300 a quarter minimum. A: Yes, you can be your own Hostess anytime you want. You can invite your family & friends into your own home and have a workshop. You would be the Hostess, receiving the Hostess benefits, & you would also be the demonstrator receiving your instant income & commission. Q: What if I decide that I don't like it once I've started. Will I be penalized if I quit or is there a certain time frame I have to be a demonstrator. A: You can stop anytime you choose. You simply just stop putting in your minimum sales. Stampin' Up! may send you reminders that your sales are due, but there won’t be any repercussions except loss of demonstratorship. But I guarantee you once you get started you won't want to stop!! Q: What kind of incentives can I earn as a Stampin' Up! demonstrator? In your first 3-4 months you have the opportunity to earn FREE stamp sets from the current catalog through a program called Stampin’ Start. 30% Off on your first order if you place it within 45 days after signing up. 150.00 and up. You can earn up to 40% commission on personal purchases & customer sales. Every year you are eligible to earn a FREE Stampin' Up! Cruise. Great Rewards - You get to pick FREE items (Logo & product) each quarter depending on your sales. The first prize level only requires $1,000 in sales per quarter, and you’ve earned a very nice prize! Complimentary catalog and mini catalogs throughout the year. Receive our Stampin’ Success monthly magazine – includes great tips & techniques! Pre-order new sets before they’re available to anyone else. A: YES!! There are many demonstrators who make $5,000, $10,000 or even $15,000 plus a month. Also, every year there are cash awards given at convention for group and individual accomplishments. One is for Rising Stars…ONLY brand new demonstrators qualify for this one!! A: Of course not!! However, because this is a multilevel marketing company we have the opportunity to earn a residual income. The best way to earn a substantial income is by growing your team through recruiting! Q: How much support can I expect from my Upline? A: You can expect to receive full training from me. Including business tips, ideas, stamping techniques, and ongoing support through our Group website & email! I will be your biggest cheerleader for whatever goals you want to achieve with Stampin' Up! A: Stampin' Up! has many resources for demonstrators. The Catalog, the Stampin’ Up! 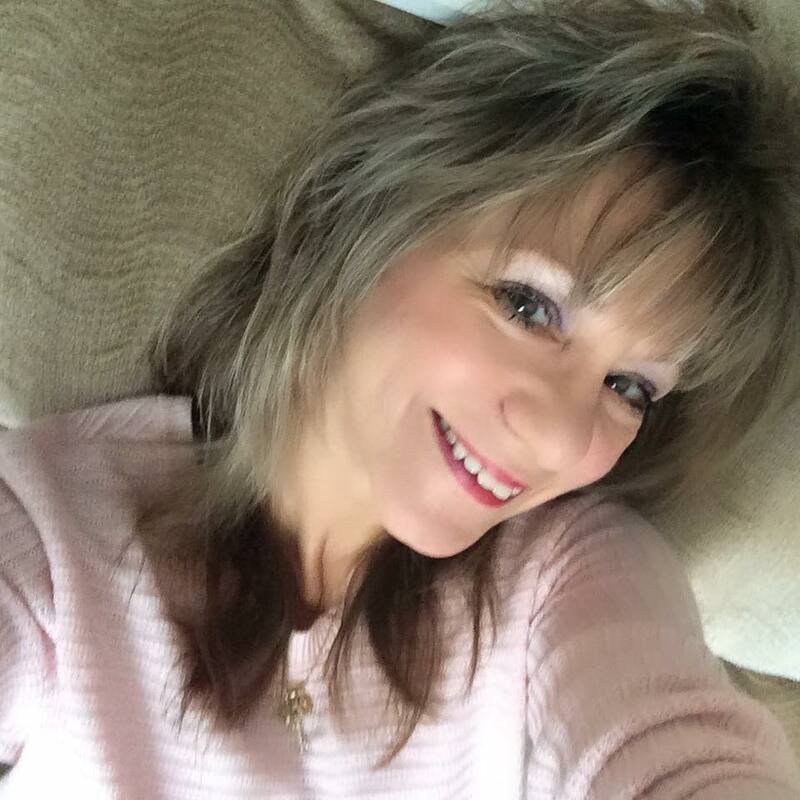 web site, the monthly Stampin' Success magazine, training videos, Stampin' Discuss, and my web site. It is OKAY to copy your projects from these sources and use them at your workshops. You do not have to do everything by yourself. Q: Are there any Stampin' Up! Events that I can attend as a new demonstrator? A: Yes, almost all of them!! Every year Stampin' Up! has its annual convention. It will be in Utah in July, 2012 and is 4 days long. Leadership training is a fabulous event for those at Senior Supervisor level and above. If you want to achieve greatness with Stampin' Up! this is the event for you. A: Contact me today or click on my blog or website to sign up on line! A: I absolutely LOVE what I do and I know you will, too. The friends I’ve made as a Stampin’ Up! Demonstrator is an amazing bonus I hope I have answered some of your questions. I would love to share this Fabulous Business Opportunity with you today!!! Please feel free to contact me! Q: Can I rejoin if I was a demo in the past? A: Absolutely YES!. If it's lest then 6 month you need to rejoin with the same up line, if it's pass 6 month that you are inactive you can join with any demo of your choice. Rose W. for New Recuit Colleen E.! Get a FREE big shot when y ou Join Stampin Up this Month! 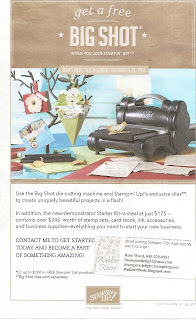 GET A FREE BIG SHOT when you join Stampin Up this month only!! Call me for more information or go right to my Blog or website to join today! YOU HAVE NOTHING TO LOSE!! !